Win + Home: Minimize all windows except the one that's currently active. Hit it again to restore the windows. Win + Space: Makes all windows transparent so you can see through to the desktop. Win + Left/Right Arrow: Docks the active window to the left or ride side of the screen. Win + (+/-): Enables the magnifier and zooms in/out. Win + P: Opens Windows' presentation settings so you can quickly adjust display settings to include a second monitor or a projector. 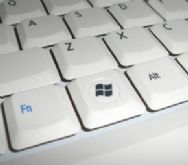 While we're on the subject of shortcuts, be sure to check out Three Keyboard Shortcuts You Need to Learn Right Now, Seven More Keyboard Shortcuts You Need to Learn Right Now, and Five Firefox Shortcuts (also best learned right now).